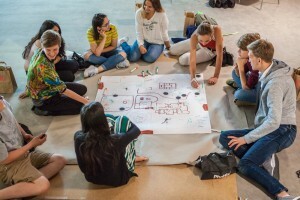 Young researchers create art, young artists delve into research. Based on HKW programs, age-suitable workshops under the guidance of selected artists offer kids the opportunity to be active on weekends or during holidays. Whether in the context of exhibitions or music festivals, kids and teens can try their hands here artistically and playfully. They can build robotic orchestras, transform remote controls into musical instruments or produce soundtracks for horror films. For the annual Wassermusik festival, teens shoot a making-of film; other holiday workshops take them to the Berlin Kiez or map their immediate vicinity. Exhibitions can be experienced in guided tours for families. Admission to exhibitions is free of charge for kids and teens up to 16 years of age.